Offers performance associated with solvent paint, with low odour properties and a non-yellowing finish. Suitable for interior and exterior wood and metal. Coverage approx 13m2 per litre. 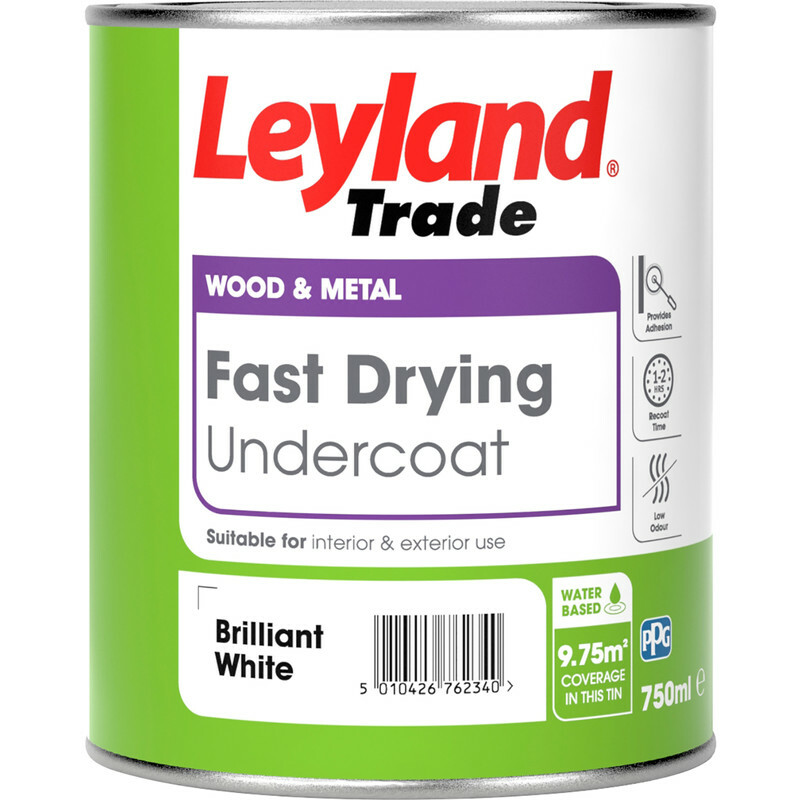 Leyland Trade Fast Drying Water Based Undercoat Paint Brilliant White 750ml is rated 4.2 out of 5 by 18. Rated 5 out of 5 by Shell58 from Undercoat This undercoat is very good. Drys quickly and is just the thing when not a lot of time. Have bought this quite a few times. Never disappointed. Rated 5 out of 5 by Chisy from Why would you ever buy spirit based paint again? This water based paint is perfect. Hate the smell of turps and the arduous clean up. This is a little more expensive but I would buy it every time. Highly recommended. Rated 4 out of 5 by Niko from Good cover Happy with this product covered well dryed within the hour good product. Rated 4 out of 5 by A DIY customer from Works as expected Bought to cover yellowing oil based gloss. Works well to cover. Dries fast but leaves brush marks resulting in a bumpy finish. But overall it does the job. Rated 4 out of 5 by samara from covers well does what it says. covers fairly well but fast drying so another coat goes on soon as its dry. Rated 5 out of 5 by grumble from Love this stuff It does what it says on the tin. Love it, dries quickly and covers well. I use with the water based gloss. Perfect combination. Rated 5 out of 5 by Equium1951 from Quick Drying Time Bought last week. Used to prime bathroom door, good coverage very quickly dried. Couple of coats, perfect! Rated 5 out of 5 by QCraven from Very good value Others have said this paint is a bit thin. Whether Leyland have taken note and acted on this, or I was simply lucky with the batch, I don't know. But the tin I had was pretty top stuff with good pigment density. Quick to dry to a pretty tough finish - I think this is pretty good value stuff.